It is important for the journals to determine the principles to be followed during the preparation of an article by considering the international standards and to check the compliance with these rules in the articles to be evaluated and to increase our scientific publishing standards. For this reason, the manuscripts should be prepared in accordance with the International Journal of Medical Journal Editors (ICMJE), the World Medical Editorial Association (WAME) and the Code of Publication (COPE). At the beginning of the evaluation system, the journal Copyright Transfer Form, signed by the authors, is requested to be uploaded to the system. - The manuscript submitted for publication must have not been published elsewhere or sent for publication. - In the manuscript submission, the Contributor Open Researcher and Contributor Identifier-ORCID ID field is required for authors of manuscript. - If you have used previously published tables, pictures etc. on the manuscript, you must have written permission from the owner of the right of publication and the authors, and must be state this in written manuscript. The legal responsibility in this regard is the responsibility of the authors. - The manuscripts submitted at scientific meetings/congress are evaluated, provided that they are stated in footnotes. - In the Turkish manuscripts, the Turkish dictionary of the Turkish Language Association or the address of http://www.tdk.org.tr and the glossary of terms belonging to the branches of the Turkish Medical Associations should be taken. - How to determine sample size, how sampling is done and which statistical methods and principles are used in data analysis should be given under “Statistical Analysis” sub-section at the end of “MATERIAL AND METHODS” section. All manuscripts are carefully checked for similarity or plagiarism. In the submitted scientific manuscript, all authors should have a direct academic-scientific contribution. The correspondence author with the journal carries the responsibility of the final manuscript in the name of all authors. In all the studies in which the "human" element is found, the principle of conformity to Helsinki Declaration Principles is sought. In these studies, the authors are required to indicate that they have been working in accordance with these principles in the MATERIALS AND METHODS section of the manuscript. In addition the authors should receive "Informed consent form" from the ethics committees of the institutions, and the people involved in the study. If "Animal" was used in the study, the authors should state in the MATERIAL and METHODS section that their studies have been approved by animal ethics committees and that they protect animal rights in line with the "Guide for the Care and Use of Laboratory Animals"
"Informed consent" should be obtained from patients regardless of the identity of the patient in the case report. If there are institutions that provide direct or indirect financial support to the work, the authors should state on the presentation page how the relationship is. If there is no relation, it should indicate it. If it is necessary to obtain "Ethics Committee Approval", the authors should declare that they have received the written ethics approval in "Materials and Methods" section. "Oral ethical approval was obtained expression" must not be used. All publications / copyrights of the manuscripts accepted for publication belong to our journal. The thoughts and suggestions in the manuscripts are entirely the responsibility of the authors. For each manuscript, authors should complete the “Copyright Transfer Form” and submit it to the journal with the manuscript. The language of the journal is Turkish and English. The manuscripts to be submitted to the journals should be in the following categories and should be prepared in the specified structures. a) Original Research Article: Original prospective or retrospective studies of basic or clinical investigations in areas relevant to medicine. - Abstract (the structured abstract contain the following sections: Aim, Material and Methods, Results, Conclusion; average 200-250 words; Turkish and English). b) Review: The authors may be invited to write or may submit a review article. Reviews including the latest medical literature may be prepared on all medical topics. Authors who have published materials on the topic are preferred. c) Case Report: Brief descriptions of a previously undocumented disease process, a unique unreported manifestation or treatment of a known disease process, or unique unreported complications of treatment regimens. They should include an adequate number of photos and figures. d) Editorial Commentary/Discussion: Evaluation of the original research article is done by the specialists of the field (except the authors of the research article) and it is published at the end of the related article. e) Letters to the Editor: These are the letters that include different views, experiments and questions of the readers about the manuscripts that were published in this journal in the recent year and should be no more than 500 words. There’s no title and abstract. The number of references should not exceed 5. Submitted letters should include a note indicating the attribution to an article (with the number and date) and the name, affiliation and address of the author(s) at the end. The answer to the letter is given by the editor or the author(s) of the manuscript and is published in the journal. f) Scientific Letter: It is the articles that discuss the general medical issues and discuss the subject by referring to the published scientific articles. g) Surgical Technique: These are articles in which surgical techniques are explained. h) Differential Diagnosis: These are case reports which have topical importance. They include commentaries related with similar diseases. i) Original Images: Self-explanatory figures or pictures on rare issues in literature. j) What is Your Diagnosis? : These articles are related with diseases that are seen rarely and show differences in diagnosis and treatment, and they are prepared as questions-answers. k) Medical Book Reviews: Reviews and comments on current national and international medical books. l) Questions and Answers: Scientific educational questions and answers on medical topics. The manuscripts submitted for publication must be reviewed in accordance with the following formal principles. The manuscripts should be prepared as Microsoft Word ® document. The manuscripts should be written in 1.5 spaced, 12 point, justified and "Times New Roman" character. There should be a 2.5 cm space on the edges of the page and the page numbers should be placed on the upper right corner of the page. The authors should indicate the type of the manuscript they have submitted, that no other journal has been sent before, the persons and organizations, that fund the work, and their relationship to the authors on the cover letter. 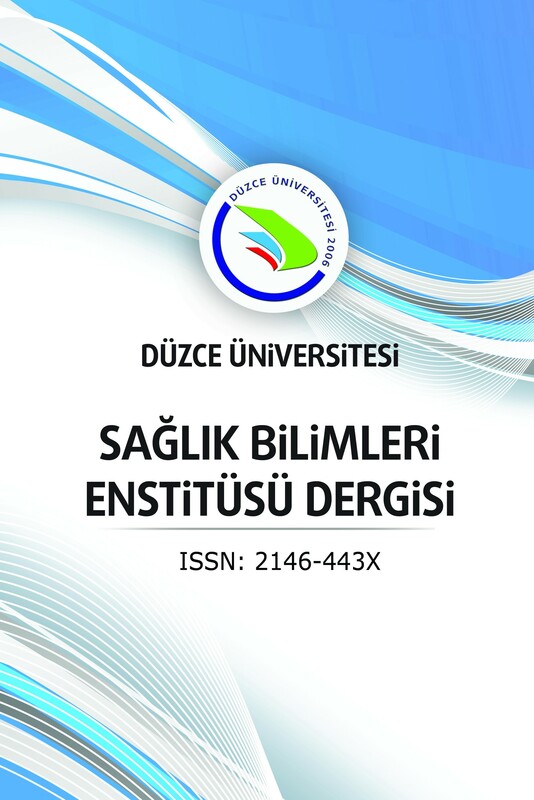 On the title page, a long title and running title with maximum 40 characters of manuscript should be written in Turkish and English, should be given the information about authors’ names, academic titles, ORCID® numbers, and affiliated institutions, also corresponding author should be stated with an address, relevant phone and fax numbers. If the manuscript has been presented in a scientific meeting/conference/congress, the meeting name, date and place must be written. The abstract should be written in Turkish and English according to the type of articles. They should be minimally two, and should written Turkish and English. English keywords should be appropriate to “Medical Subject Headings (MESH)” (www.nlm.nih.gov/mesh/MBrowser.html). Turkish keywords should be appropriate to “TR Index Keywords List” and “Turkish Science Terminology” (http://www.bilimterimleri.com). Abbreviations that are used should be defined in parenthesis where the full word is first mentioned. For commonly accepted abbreviations and usage, please refer to Scientific Style and Format: The CBE Manuel for Authors, Editors, and Publishers, 6th ed. New York: Cambridge University Press, 1994. All figures, pictures, tables and graphics should be cited at the end of the relevant sentence. Explanations about figures, pictures, tables and graphics must be placed at the end of the manuscript. Pictures/photographs must be in color, clear and with appropriate contrast to separate details. Figures, pictures/photographs must be added to the system as separate .tif, .png, .jpg or .gif files (approximately 500x400 pixels, 8 cm in width and scanned at 300 resolution). The table headings should be written on the table, and the figure/graph headings should be written under the figure/graph (Table 1. and Figure 1. ), with the first letters being upper case. Any conflict of interest, financial support, donation and other editorial support (English/Turkish evaluation) or technical support must be stated in this section immediately at the end of main text (before the References). Vancouver style should be used in text representation of references. References should be numbered according to order of use and should be given in parentheses at the end of the sentence. References section should be formed according to the reference order cited in the text. EndNote ® or similar program can be used for easy management of references. However, before the manuscript is sent to the journal, the list of references should be in plain text. All authors should be listed if 6 or fewer, otherwise list the first 6 and add the et al. Personal experiences and unpublished papers cannot be given as reference. DOI is the only acceptable on-line reference. Initials of author’s names and surnames. Titles of article. Journal name. Year; Volume (issue): Page numbers. Abood S. Quality improvement initiative in nursing homes: the ANA acts in an advisory role. Am J Nurs [Internet]. 2002 Jun [Cited: 2002 Aug 12]; 102(6): [about 1 p.]. Available from: http://www.nursingworld.org/AJN/2002/june/Wawatch.htm. Initials of author’s names and surnames. Book title. Edition number. City: Publisher; Year. Encyclopedia or dictionary name. Edition number. City: Publisher; Year. Chapter; Page numbers. Author's surname and initials. Thesis name [thesis type]. City: University or Institution name; Year. Borkowski MM. Infant sleep and feeding: A telephone survey of Hispanic Americans [PhD dissertation]. Mount Pleasant (MI): Central Michigan University; 2002. The initial (s) of the surname (s) and name (s) of the author (s). Name of the paper. Editor (s) of the surname (s) and name (s) of the editor (s). Conference / Congress / Symposium name; Year; City. Publication place: Publisher; Year. Page numbers. Waterkeyn J, Matimati R, Muringanzia A. ZOD for all: Scaling up the community health club model to meet the MDGs for sanitation in rural and urban areas: Case studies from Zimbabwe and Uganda. International Water Association Development Congress; 2009 Nov 15-9; Mexico. Author / organisation's name. Title of the page [Internet]. Place of publication: Publisher; Date or year of publication [Updated: YYYY Mon DD; Cited: YYYY Mon DD]. Available from: URL. Cancer-Pain.org [Internet]. New York: Association of Cancer Online Resources, Inc.; c2000-01 [Updated: 2002 May 16; Cited: 2002 Jul 9]. Available from: http://www.cancer-pain.org/. The correspondence author should fill in the "Copyright Transfer Form" and send it to the journal together with the manuscript. The authors should state the name of the 3 referees and the current contact information (mail, e-mail, telephone, fax) on a separate title page for evaluate of the manuscript. Editors maintain the right to choose referees. The manuscripts should be uploaded to the journal system from dergipark.gov.tr. Part ® is a registered trademark of Microsoft Word and EndNote.